Summer days in south Mississippi, as expected, have become rather hot. I know the pain of heat is here when nighttime temperatures don't go below 70 degrees. And it has been that way for a while. Add in high humidity and its time to stay inside and turn the air conditioner to a comfortable temperature. There are two exceptions when it is better to get out -- morning hours, or later night hours. One can get out early or late to cut the grass or buy groceries. With not having any rain here to speak of for about a month or so, there's not much grass to cut. Its amazing that weeds continue to sprout, even without water. None-the-less, there are times when we have to get out in the middle of the day. And the major one now is having to take my wife for therapy following her stroke. Most of the appointments range from 9:30 a.m. until about 3 p.m. That means being out in the middle of the day -- at its hottest. Those are the times when I can feel myself drawing on remembrances of cooler places -- either the West Coast or the Great Smoky Mountains. The West Coast has been a favorite place since I was about 10 or 11 years old. A family vacation took us to Rosemead, Calif., to visit relatives. We kids were playing out in the backyard when all of a sudden I had this epiphany. It was at that time I fell in love with the low humidity of the West Coast (I could say I fell in love with California but a lot of people these days don't like California for one reason or another). Our trip that year also took us up to San Jose to visit other relatives which included a one-day trip to Yosemite. We may or may not have gone to San Francisco. I don't remember. I just know that some 25 years later my wife, first son and I made it to San Francisco on a three-week camping journey. We chose to stay in a motel there. 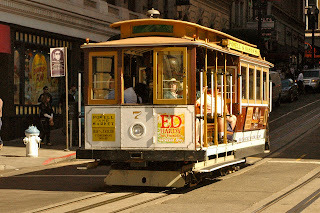 The next morning we awoke to a cool and foggy city and promptly found a cable car to ride down to Fisherman's Wharf. What a delight! As I sit in Coffee Fusion this morning (with the temperatures rising), my mind takes me back to those two trips. And they were really "cool" trips. I am so lucky to spend my winters in Atlanta and my summer in Portland, Oregon. I'm just glad it's not the other way around. I'm with you, I like to time my outside excursions in early am or late evening.